The Observatory is the home of Al and Anne, and about three thousand trees. The NurseryWe have been growing trees since the early sixties. The first tree arrived and lived in a margarine container on the outside kitchen window sill. It is an oak, now 30 years old, and we are waiting for it to grow its first acorns. We now know a lot more about trees, and have a wide range of well established and hardy trees, including maples, pines, zelkovas, crab apples, field maples, larch, hawthorns, oaks, hornbeams, and many other British trees. 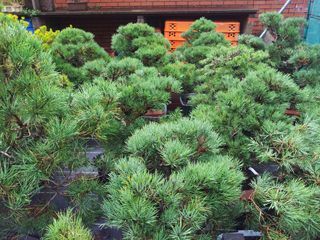 We specialise in home grown hardy trees, which we grow and train for development into bonsai. We have experience of many native British trees. Most of our trees have been grown over a long period from whips. Some have also been grown from cuttings and seed. We do not sell collected trees. Sometimes things look very different. The picture below was takaen in 2014. Trees are generally started in dwarf pots, until they establish a good root system, and then gradually potted on, into half or full seed trays. We don't normally wire the trees to the pots, because with a good flat root system, they are completely stable, and stand up to the winter elements quite satisfactorily. We do not bring any trees in for winter protection, so our trees can be said to withstand winter temperatures and conditions similar to those in our area. Only if temperatures dropped to 10 degrees C below freezing, would we worry and selectively protect pots. Temperatures below this we have not experienced, but many if not all the trees would probably be all right for short periods. As well as trees in pots, we also have a program for field grown stock. We select a proportion of 2 - 3 year old trees, and transfer them to the ground for maybe 5 or 6 years. This is certainly a good way to obtain large trunk size. These trees are lifted and moved approximately every two years, and roots trimmed. They are also pruned regularly and even styled whiled they are in the ground, so that the resultant tree looks pretty good when it is finally put into a container. If it's not ready, it goes back in the ground again. In theory we like to check the roots of all container grown trees every year. 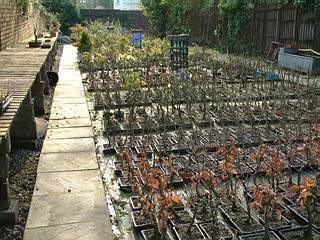 In practice the warm weather just arrives too quickly, but most trees are repotted at least every two to three years, repotting starting any time from September on, and continuing until growth is too far advanced in the spring. 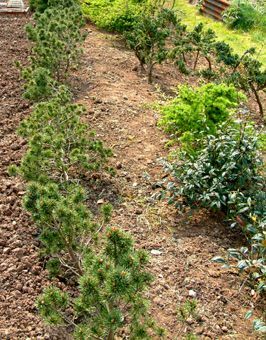 They are regularly pruned, to encourage bud back, and those that are particularly being groomed receive more attention through the summer to achieve ramification. We have no hard and fast rules about feeding, frequently changing our preferences. We do however adhere to the higher nitrogen feeds in the spring and low or no nitrogen at the end of summer. Over the years we have developed a preference for organic. This year we are applying calcified seaweed to everything in sight, but as I inferred, it is a bit arbitrary. We apply a feed to the soil when we re-pot. and use a weak foliar feed on a regular basis. We use a fungicidal spray at leaf fall and again just before bud burst in the spring. During the growing season we do use insecticides and fungicides, if we think them necessary, but in moderation. We firmly believe in Superthrive, (not available for the last year, and now run out of stock! ), and used to use it on newly lifted trees, sickly trees, and in with the foliar feed on a regular basis.